Successfully Added CPAP Ventilator - Data Management, Integrated Air Humidifier, 3.5-Inch Display, EPR, IPR, SD Card Slot (White) to your Shopping Cart. Never experience breathing problems at night again with this professional-grade CPAP ventilator from MOYEAH. With this smart health gadget at your side, everybody will be able to enjoy a good and comfortable nights’ rest. By treating you to a continuous flow of positive airflow pressure, it makes sure that you’ll always inhale sufficient oxygen. This helps you to breathe comfortably and naturally throughout the night. 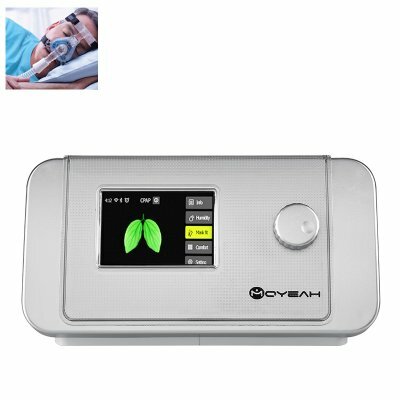 Thanks to this, the MOYEAH CPAP ventilator is a great tool for people who are suffering from breathing problems or sleeping apnea. This high-end health gadget can be used efficiently for personal usage and professional usage alike. Whenever the MOYEAH CPAP ventilator detects a patient breathing, it will turn itself on automatically. The machine applies a low air pressure before sleeping which helps you to fall asleep in a natural and comfortable manner. After the patient has fallen asleep, the MOYEAH CPAC ventilator will increase its air pressure. Thanks to this, it makes sure that you’ll always inhale a proper amount of oxygen with every breath you take. The smart technology behind this machine allows it to apply less pressure when you are exhaling and more pressure at times of inhaling. This intelligent feature will stimulate your natural breathing rhythms and will increase your comfort throughout the night. This professional-grade CPAP ventilator comes with a 3.5-Inch display. On there, you’ll be able to read real-time data and easily browse through the different operating modes. The smart display will automatically adjust its brightness after dark and the machine itself features a low sound production. Thanks to this, you won’t be bothered at night while you’re trying to fall asleep. By allowing you to slide in a 32GB SD card, this breathing aid lets you store up to a years’ worth of data. This makes it easy for you to analyze your sleeping rhythms to see whether your breathing patterns have changed. Simply slide on its mask, lay back, and enjoy a comfortable night of sleep. From now on, you’ll never experience a sleepless night again. This CPAP Ventilator comes with a 12 months warranty, brought to you by the leader in electronic devices as well as wholesale electronic gadgets..